I don't think I posted pics of Matt actually in his marching band uniform. At least not on this blog. I must rectify this. There. 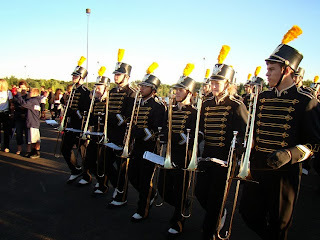 Pictures of Matt, in his marching band uniform, playing his instrument or marching. I'm done here. Oh wait, not quite. I'm done with Marching Band for this year, but not done with yammering on about my precious charming little children. Family birthday celebrations are getting smaller and smaller. It was weird. Matt had his requested birthday dinner of taco salad, blue and green jello, and strawberries with just Jim and me. Hayley was at work. And the rest of the kids...well, who knows where they were! They all chimed in as much as they could though. Both Elders sent emails wishing little brother a happy birthday, and Mrs. McCall (that is still weird to say!) sent appropriate electronic greetings as well. So there you go. 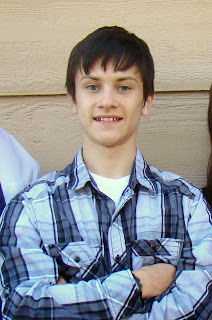 Matt turned 15. 1. My mother has complained about me not updating. She is sick of looking at Matt in the tree and all those apples. So here you are, Mother. 2. I hear things while in the shower. Bumps and thumps and noises that I don't hear when I am not showering. I don't know if I'm more paranoid when wet or if we have a poltergeist that gets rowdy only when the house has one occupant who is in the bathroom. 3. Also the cats have taken to following me around constantly. They waited outside the bathroom door while I was showering, and right now, they are sitting in the living room looking at me. It's creeping me out. 4. Happy birthday to Matt.